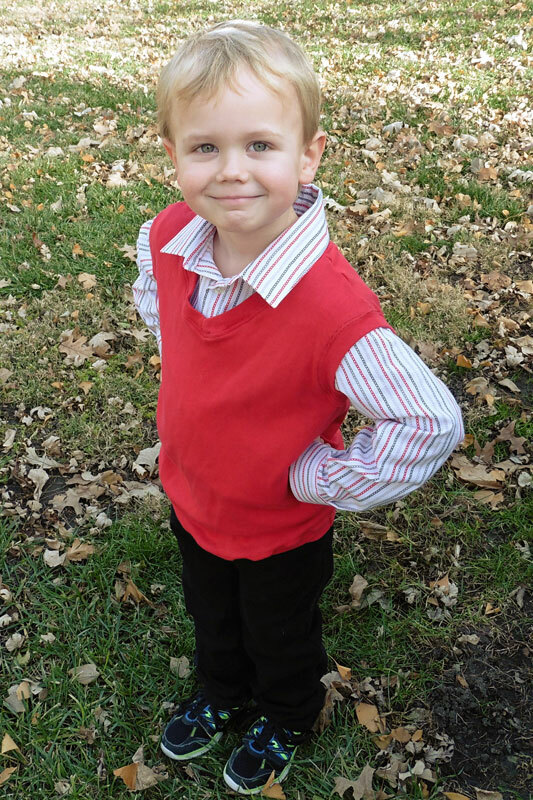 Parker’s T-shirt to “Sweater” Vest Hack – Everything Your Mama Made & More! 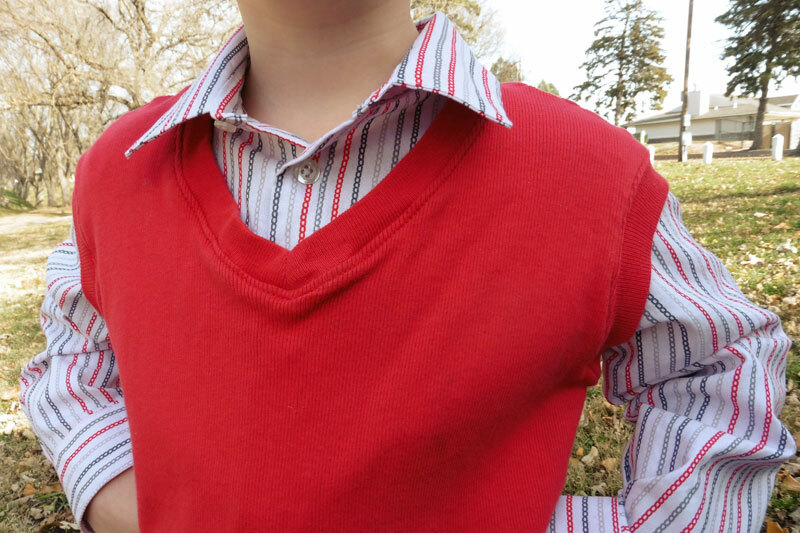 I love the look of a sweater vest over a button down shirt on little boys and wanted to make something similar for one of my sons this winter. After looking through my pattern stash, I couldn’t find anything designed quite like I wanted. So I decided to hack Parker’s Vintage Fit T-shirt to create a knit “sweater” vest. 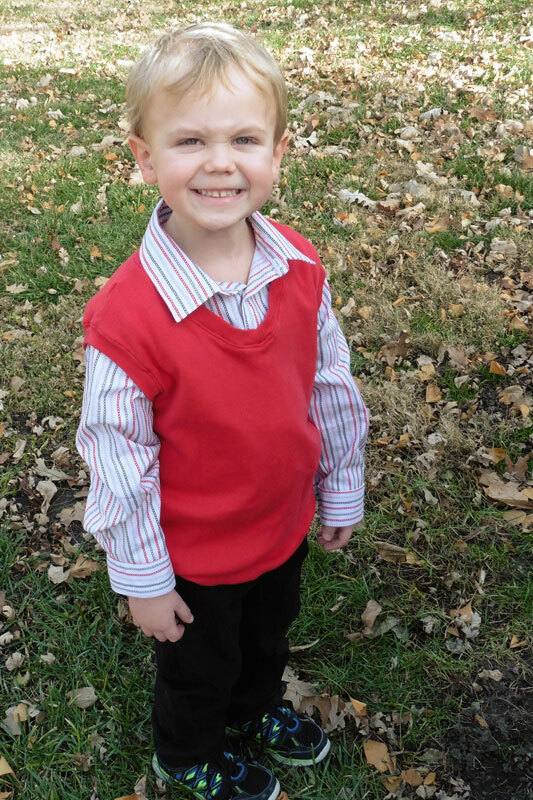 Christmas is the best time to “nerd out” with a sweater vest, right? This hack was pretty simple. The key was to size up enough to fit over the button down but not so much that it looked too baggy. I measured his chest with the button down shirt on and then went up one size from there so that it wouldn’t be too tight since Parker’s has a slimmer fit. I ended up using the pattern two sizes bigger than my guy normally wears for Parker’s Vintage Fit T-shirt and in retrospect the only thing that needs adjusted is the length, since it’s a bit long. I used the v-neck version and replaced the sleeves with bands. I cut the bands to about 80% of the size of the armscye and the same width as the neckband so they’d “match” (for the size 7 that I made, I used bands 11″ long by 2″ wide). I put them on the armscyes using the same directions as included for the crew neckline band. The only other modification I made to the pattern was to add a band around the bottom of the shirt, so it would lay similarly to how a real sweater vest pulls in at the bottom. I made it about 80% of the size of the bottom hem and cut it 4 inches wide so the finished band would be a bit less than 2 inches. I love how this look came together! 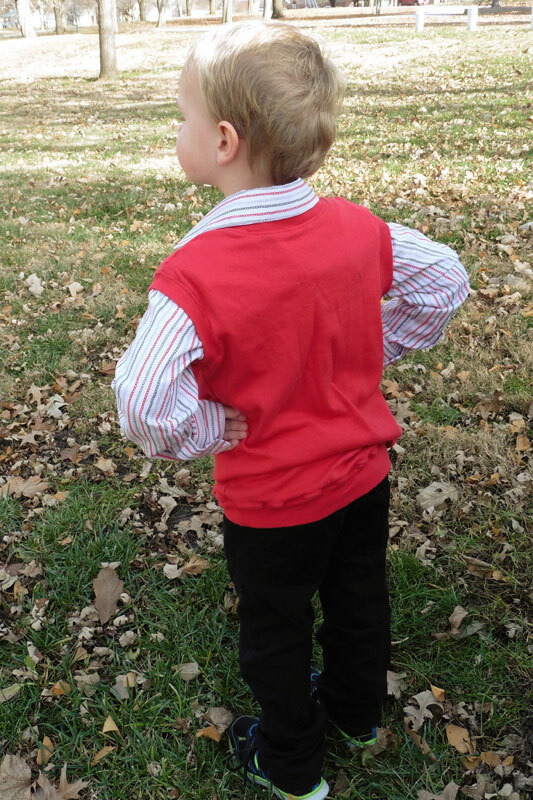 A “sweater” vest hacked from Parker’s Vintage Fit T-shirt was just what his outfit needed to feel complete. As always, we love to see your EYMM creations shared on the Facebook page or in the group (which is also an excellent place to ask any questions during construction).